Heme or iron-porphyrin is a multifunctional molecule that acts as a cofactor in species ranging from humans to bacteria for two vital cell activities: respiration and elimination of ROS. Heme is also an important iron source for pathogenic bacteria. Associated with hemoglobin within the blood of vertebrates, heme is the main iron reservoir within host. Because of its redox activity (Fenton reaction), heme si also highly toxic. During infection, pathogens are therefore facing heme toxicity while depending on it for their survival in the host environment. Our research activities focus on the mechanisms expressed by Gram-positive pathogens (Streptococcus agalactiae and Staphylococcus aureus) to manage host heme during colonization and infection. 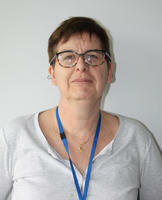 We are also interested in understanding heme interactions with the food bacteria Lactococcus lactis. Most bacteria have evolved sophisticated machineries to scavenge heme from the host. However, due to its high reactivity, an excess of heme is toxic for bacteria. Thus, the ability to accurately regulates intracellular heme concentration is critical to many pathogens. A conserved mechanism of heme detoxification in several Gram-positive pathogens relies on the HrtBA efflux pump. This specific ABC transporter enables pathogens to secrete intracellular heme. We recently demonstrated the relationship between menaquinone induced membrane accumulation of heme and HrtBA activity. Our hypothesis is that HrtBA heme effux mechanism could be related to that of a vacuum cleaner or a flippase transporters such as MDR pumps. 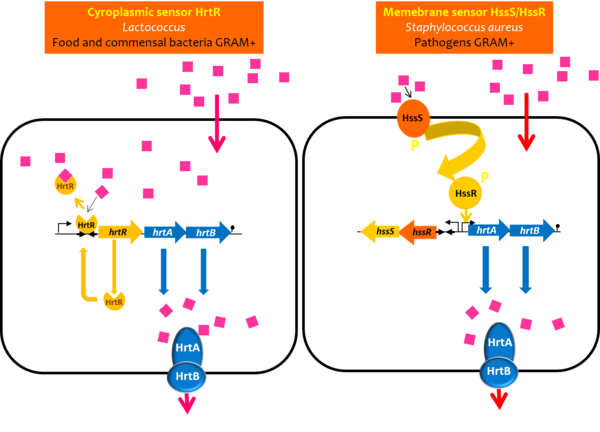 In numerous Gram-positive pathogens, heme efflux is regulated by a two component system (TCS) called HssRS (Hss; heme sensing system), where HssR is a transcriptional regulator and HssS is its cognate transmembrane histidine kinase. HssS is presumed to be the heme sensor that activates HssR through phosphorylation. 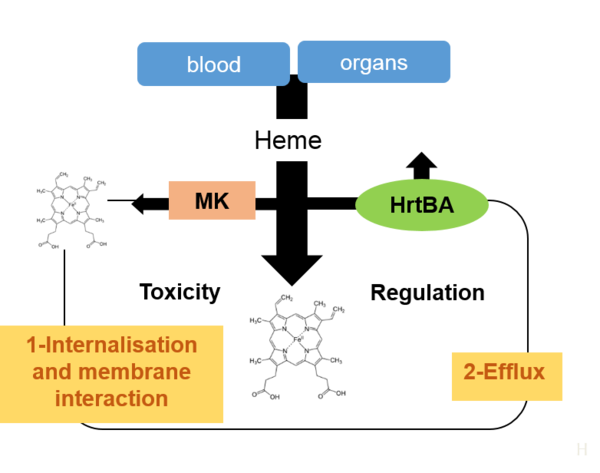 The coordinated expression of HssRS and HrtBA enables pathogens to withstand high heme concentrations, indicating a central role of efflux in heme homeostasis. Our project is aimed at understanding the mechanisms of heme recognition and signal transduction by the HssS membrane sensor in our 2 model bacteria Staphylococcus aureus and Streptococcus agalactiae. We also recently identified a new pathway for the regulation of HrtBA expression in Lactococcus lactis which relies on a cytoplasmic hemoprotein HrtR, a TetR family transcriptional regulator. This regulation pathway is present in food and commensal bacteria whereas the HssRS two component system is widespread among pathogens. Using bioluminescent bacteria and heme-responsive reporters for in vivo imaging, we constructed a series of strains (Lactococcus lactis, Staphylococcusaureus, Enterococcus faecalis and Streptococcus agalactiae) to follow the infection in a mouse model by real time imaging (IVIS). We recently show that the capacity of S. agalactiae to overcome heme toxicity is required for successful infection, particularly in blood-rich organs. Host heme is simultaneously required, as visualized by a generalized infection defect of a respiration-negative mutant. We conclude that S. agalactiae response to heme is organ-dependent, and its efflux may be particularly relevant in late stages of infection. This work has been recently supported by the ANR HemeStockExchange (2013-2017) and ANR ALIAS (Aliments, Alimentation et santé) ANR-11-IDEX-0003-02 (end 2016). Our research project is currently supported by the ANR HemeDetox (2018-2021).